After a year-long collaborative effort between Sue and Cheryl Styler, "Remembering Old Nauvoo" was entered and won a prestigious Merit Award in the 11th International Art Competition (2019) sponsored by the Church of Jesus Christ of Latter-day Saints. This work will be on display at the Church History Museum in Salt Lake City (across from Temple Square) from now until early October. “I will remember the works of the Lord: surely I will remember thy wonders of old. I will meditate also of all thy work, and talk of thy doings” (Psalm 77:11–12). A visitor to today’s restored Nauvoo can sometimes get lost in the reality of the present. However, as we meditate on this view of old Nauvoo, we are impressed by the seminal importance of this city and its marvelous temple. Weary and poor, nonetheless the saints obeyed the commandment to build a temple where they could receive eternal ordinances, both for themselves and for their kindred dead. They made sacred covenants of sacrifice and consecration which carried them forward through the great trek westward and gave them strength to build up the Kingdom of God in more than difficult circumstances. Surely the Lord knew of their poverty, yet He also knew how critical temple covenants would be for these fledgling saints. We love to meditate on the wonders of the Lord manifested in Nauvoo and on the concrete evidence of obedience by early members of the Church in building the temple. Remembering this great period in our past gives us strength and courage to continue His work in the present. This fiber art work is inspired by an anonymous illustration from 1842 found in the Illinois State Historical Library. 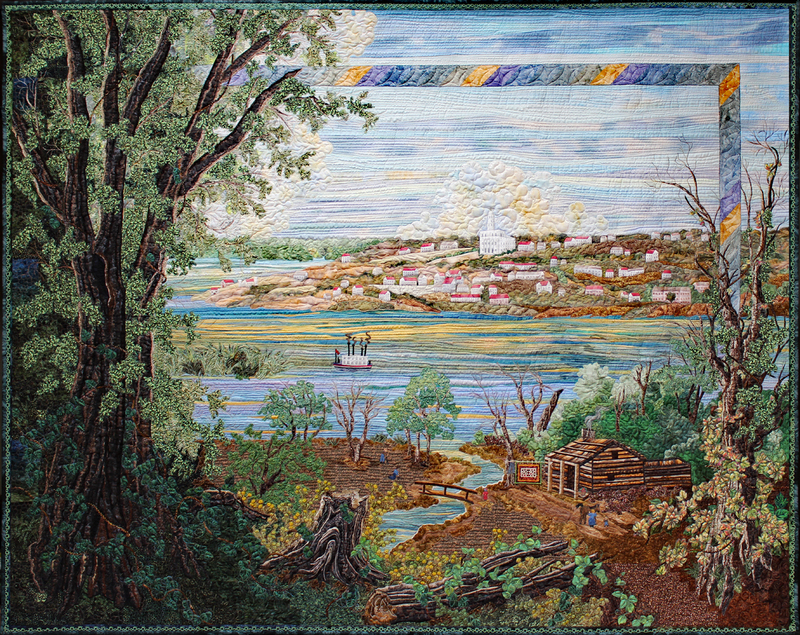 A collaborative effort by Susan McBride Gilgen and Cheryl Styler, they have chosen to depict Nauvoo with the temple as it may have appeared in 1845-1846. St George, Utah 80" x 58"